JAL will be serving "Del Monte Sky Tomato" in Class J during October 2013. Image by Tokyo Sky Tree. During October 2013, Japan Airlines (JAL) will be serving "Del Monte Sky Tomato", a premium tomato juice, in Class J. So what's so special about this tomato juice? Del Monte Japan has spent the past 20 years to create this perfect original tomato called "Inca Red" just for this tomato juice! Del Monte Japan and American researchers first discovered a finger-sized wild blue tomato in the Machu Picchu region back in 1992. Since then, Del Monte Japan has spent 20 years to improve this tomato without genetically modifying it. 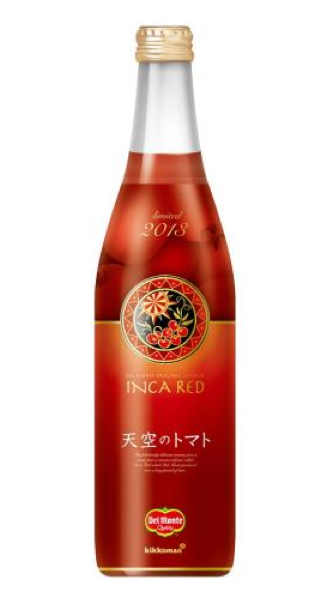 After 50 generations, it has finally created Inca Red with the perfect taste and size for this tomato juice. According to Del Monte Japan, this juice has a sour fruity aroma, a sweet and well-balanced taste, and would leave a clean aftertaste. Well I am not sure if that's true but if you want to find out you'd better hurry up! Because only 8,000 bottles of them are available for sale at Tokyo Sky Tree! It will go on sale on October 1 2013. The suggest retail price for the 500g bottle is JPY 1,000. Of course, the lucky Class J passengers flying JAL during the month of October can drink as much as they want onboard (until it runs out)! For more details, you can refer to the press release (Japanese only) and the Del Monte Sky Tomato website (Japanese only).